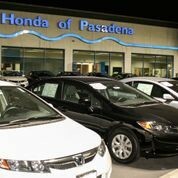 An LED lighting installation by Cireon at Honda of Pasadena (US) will result in a $66,337 rebate from Pasadena Water & Power and a $54,000 federal tax deduction for the 53-year old auto dealership. SoCal Image LED oversaw the project, which cost $155,000. With the combined rebates, the net cost is $34,000. In addition, the energy savings that the new system will provide to the dealership is just under $6,759 per month, with and expected payoff of five months.